Like most of New York, I'm pretty much always on the look-out for a place to meet with a couple of chums where we can slug back some good wine and eat something delicious and not break the bank. Not an easy ticket to fill these days. So when the charming Bunni suggested that Bakerina and I go with her to try the newly re-opened Panorama (an italianate resto that had moved from the corner of Second Avenue and East 85th St. to a few doors down, into the middle of the block on 85th between 1st and 2nd aves), I was game. I'm always game for a night out with the girls, despite the grumbles it inspires from G, who doesn't take kindly to having his comfort object (read: person who makes dinner) taken out of his immediate radius. I vaguely remembered the old Panorama. It was fine, but as far as I could recall, there wasn't a lot to set it off from the rest of the pack of Upper East hangouts that run down Second Avenue from 86th St. down to the mid-Seventies, usually filled with preppyish types who are as scornful of me as I of them, I'm quite sure. It had whatever bevvies are required by that sort of joint, and a fairly standard menu of Italianish food. But the new Panorama is something else altogether. This isn't a place where overgrown Upper East boys and their molls come to drink and force others to sigh over the noxious behavior of the overprivileged. This is a place with a great little wine list, delicious standard dishes and creative specials, and very considerate service -- all at excellent prices. To start with, our wines were lovely. I chose a Viognier that was described as have lychee and apricot notes, and it did not disappoint, not at all. Scented and fruit-forward, but still crisp, it was the perfect wine for a spring evening. B and B were also fond of their reds (Bakerina's was a Pinot Noir; Bunni's was something I haven't heard of; both were quite good). On reading the menu, I received the happy and unusual surprise of a pricing scale that seemed more than fair. This was certainly a place that, if the food didn't disappoint, would merit more visits. And no, it did not disappoint. We shared good appetizers of shrimp in garlic sauce, crispy calamari and a refreshingly creative salad with beautiful greens, citrus, and almonds in a strawberry vinaigrette. Then we went on to pastas. Bunni and Bakerina each had one of the specials, Bunni's a good paglia y fieno (green and white homemade pasta in a creamy sauce with ham and peas) and Bakerina's a nice mound of spaghetti in a slow-cooked, meaty ragu. 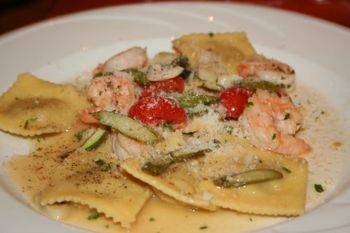 I made a special request -- I wanted the lobster ravioli from the menu of specials, but I wanted it in the light cardinale sauce described on another dish -- white wine, garlic, cherry tomatoes, asparagus and shrimp. The kitchen had no trouble accomodating this request, something else that's very nice and not always easy to find. In a word -- delicious. All was perfectly cooked, and my entree in particular was light and lovely, just what I wanted. No room left for dessert, but that was fine too. So -- should you find yourself on the Upper East for one reason or another, say after a day of museuming on Museum Mile or parking yourself in the park, give a thought to Panorama. MMM - lobster ravioli is to die for! Got a recipe for cardinale sauce? I've never heard of it. As I read this I'm feeling downright disappointed that this isn't someplace close to me that I could head out to for dinner later this week. Just reading your descriptions of everyone's dinner made me hungry. I know I've already told you this, but I want to make it public, shout it from the rooftops, even: I *love* your telling of our tale. What a grand time I had with you two. I can't wait until we can do it again. I came across your blog and find it a very interesting read! And I also find you are in Manhattan which is awesome since I am in the same area. Hope your work has settled down a bit and you are able to blog again regularly. Looking forward to your blog. Btw, I recently started a food blog too to escape from the trials of the spring and summer :). Would appreciate your reading and letting me know your comments! different. Something's changed, and I can't quite put my finger on it. He's less responsive." He seemed to me to be going inside himself, retreating from all of us. http://www.nikesoccercleatsshoes.com By Thanksgiving day, he had stopped responding, although he was not unconscious. He simply would not open his eyes, and batted away any form of help or inquiry, refusing even to take water. During the phone call I made to ask for counsel, one of my wise and beloved cousins (who is also a gerontologist) said, upon hearing my description of his behavior, "He's trying to leave, sweetie," confirming what I had both suspected and feared. I can't wait until we can do it again. I spend too much time thinking about the workers. Yeah, what a lie. I take home those petit fours out of pure, greedy self-interest.